Paris on Saturday saw a second major uprising of Yellow Vest protests. 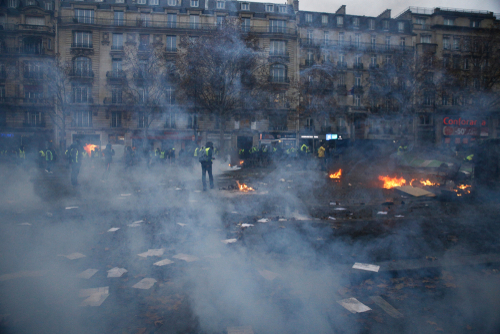 Many are now arguing that the rioting on the Champs-Elysees has been instigated by extreme elements that have infiltrated the movement to further a second French Revolution. Some 20 stores were looted or set on fire as well as one bank. Needless to say, the Yellow Vest movement has now accepted violence as a legitimate tool to achieve their goals. In this regard, the Yellow Vests have indeed crossed the line and moved into a revolutionary posture. They are fed up with the diminishing standard of living in the name of endless socialism that justifies ever increasing taxation. The government continues to ignore the Yellow Vests and believe they will just fade away. On the other hand, they argue that after 18 weeks of protests, the government still refuses to listen to anything. This refusal to even listen appears to be instilling more and more violence. Macron has no intention of surrendering the dream of the EU and he maintains that he is in charge and these protesters do not represent the whole of France.